Stephane Reynaud writes wonderful cookbooks. They are firmly French, accessible, and honest. 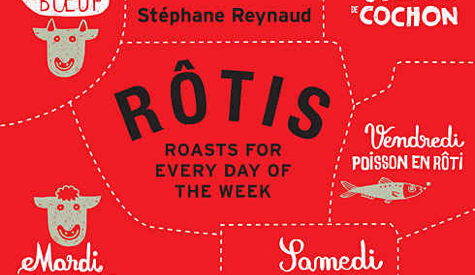 His latest, Rotis: Roasts for Every Day of the Week (Melville House 2011) is hopefully not his last. 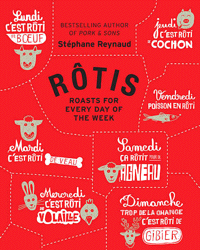 It is a clever book that is divided into the days of the week, each having a different roast – Lundi C’est Roti de Boeuf (Monday is Beef Roast), Mardi C’est Roti De Veau (Tuesdays are for Veal Roasts) and so on. Rotis is full of information, ideas, and suggestions beyond the recipes – it is a rich book that demands high quality ingredients. If Simon Hopkinson taught you how to Roast a Chicken, Stephane Reynaud will teach you how to roast everything else. Super Chef: Your inspiration for one of your other books, Pork & Sons, was your grandfather and his butcher shop. Was he the inspiration for this book? Stephane Reynaud: When you grow up in a little village, the kitchen and the table was the most important place in the house. My grandparents worked hard all week. They closed their store on Sunday at 1pm and we sat down to lunch. It lasted until 7 or 8pm. It was a magical meal. It was typical traditional food. The roast had an important place. We never knew how many people would be at the table. If there were only five, you got a thick piece, but if there were more, you cut the roast thinner. Everyone got some. Roasts are food to share. Super Chef: Meat in America isn’t always as good as in France. Stephane Reynaud: The most important thing is where the chicken is from – If it grows outside and has space and good food. We should eat less meat, but be sure to have the best meat. Even in France, the way of eating is changing. People want to have very good quality, but not eat meat every day. Super Chef:There is a recipe called Roti de nos mammies. Is that, in fact, a recipe from your family? Stephane Reynaud: Yes, it is. The beef used in this recipe is the most expensive. While I was growing up, we had beef once a week, only for Sunday lunch. In my village 1000 meters high, we ate a lot of potatoes and carrots. We had roast beef twice a month. That recipe is from my grandmother. It is a little smile to her. Super Chef: One of my favorite recipe is Travers Roti ail grill (Spare Ribs with Toasted Garlic), since it is so different from how Americans treat spare ribs. Can you tell me about this dish? Stephane Reynaud: I made that for my kids, they love that kind of spicy food. I wanted to fix something with ketchup, to grill with ketchup. You can make good food with ketchup. In France they speak about it like it is terrible, but people are eating ketchup. So, here I use it as an herb or a spice, part of the recipe. Super Chef: In America, many highly trained chefs have to choose between writing cookbooks with recipes from their restaurants, or writing cookbooks with recipes for the home cook. They focus on comfort food or food that is almost impossible to make by a cook at home. How do you feel about this division? Where do your cookbooks fall? Stephane Reynaud: My recipes are easy to fix. Rotis is for everybody. If someone doesn’t know how to cook, they will have a good meal after making a recipe. I don’t want someone to buy the cookbook, open, just start. You have to read it and the photographs will look the same as when you cook the recipe. In some cookbooks, the photographs are totally different from what the recipe will make. That is why there is no style in my book. For instance, I keep the herbs on the meat that were used in cooking. I don’t put new herbs. If you look at the photographs, the herbs are blackened, they’ve been roasted. I don’t put on new herbs for the photograph. I think people are coming back to the kitchen. There is a new way, new interest. In Paris too, you can learn how to cook a dish during a one-hour lunch break and bring the dish home. People are starting to invite friends over for dinner more often. Super Chef: Do you have plans to open a restaurant in the US? Stephane Reynaud: No, one restaurant in France is enough. Super Chef: Do you have plans to do a TV show? Stephane Reynaud: Not yet. I am speaking with different people, including Jamie Oliver’s company. There are no shows on TV in France that show how to cook a cote de boeuf. Super Chef: Do you have plans for a product line? Stephane Reynaud: No. I don’t sell my name. I work with a butcher, and create new terrines, new sausages, I work with them like this. Each chapter divides up the recipes by how long they take to prepare, fro 10 minutes to 30 minutes. He also has a page that suggests simple variations to a roast: adding asparagus and smoked bacon to a pork roast, or peaches or figs, or potatoes and chanterelle mushrooms. On Sunday, he adds “all the rest” including Thai-Style Beef Croquettes (p. 144), French Shepherd Pie (p. 147) and Moussaka (p. 147). That’s followed by a chapter called Et avec tout ca? Garnitures et Accompaignements. There are side dishes divided by the seasons. For winter, there is Traditional Gratin Dauphinoise (p. 158) or sliced potatoes roasted with cream, and a Gratin de Cardons a la Moelle (p. 159) or roasted cardoons. The photographs by Frederic Lucano that accompany each dish really do look like they just came out of the oven, in their pans – ready to be dished out, sliced on a cutting board, or presented to the waiting table. There is an amazing variety of roasting pan, cutting board, and casserole pot, that none of the pictures are dull. Collect all of Stephane Reynaud’s books: they are full of amazing recipes that will teach you good French technique and help you turn out magnificent meals – as long as you follow his advice: buy the very best ingredient you can find.